"I am extremely grateful for you and your work. It truly has made a BIG BIG difference. Even though I am still struggling, I can see the ways I am shifting my understanding of myself and where it is possible for me to go. That new vision is very powerful for me." —J.W. "I want you to know how much our work together has helped me. The skills you've taught me about how to be with myself, my emotions, and the things bothering me, have been deeply empowering and transformational - they are truly life-changing. I use them every day in my life, and actually teach them to my friends. Thank you for all you've given me - it has made a big difference in my life." —J.B. "The session touched on things I didn't even know were affecting me, and helped a deep shift happen. I've felt much better, and more focused and energized ever since - the winter doldrums aren't getting me down anymore." —C.E. 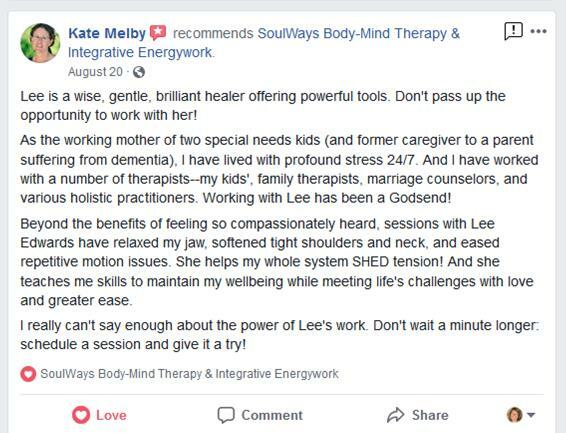 "Lee is an amazing therapist! After my series of sessions, I feel so much more connected, integrated and at home in the Universe." —K.M. "After our last session and the work we did around my family, my knees and hips were pain-free for the whole week! It was awesome - I couldn't believe how good I felt! I continue to be amazed by all that has unfolded over the course of my work with you. Thank you for all that you've given me." —T.P. "Several pieces we worked on today are major breakthroughs for me. I feel more relaxed and open than I can remember. Thanks for the great session!" “I feel like Lee heard and received me in just the way I needed and wanted to be heard. 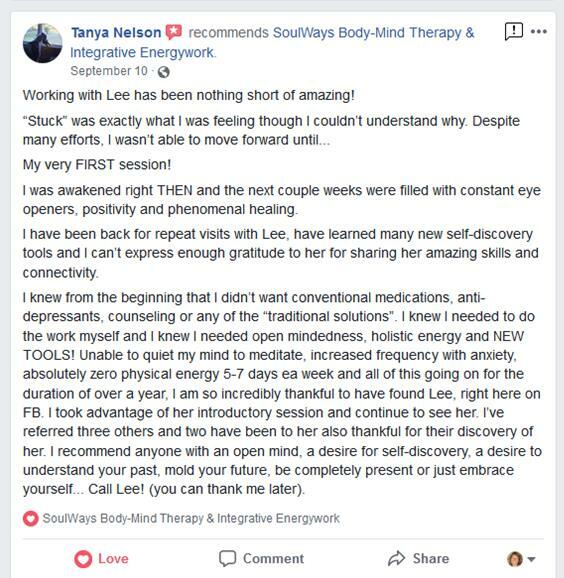 She listened deeply, guided me skillfully into deeper contact with my body and my concerns, and had excellent suggestions and perceptive insights to offer.” —H.H. 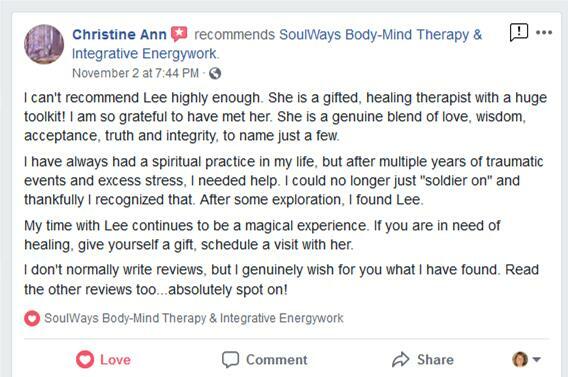 "Lee is a powerful yet gentle healer and therapist. 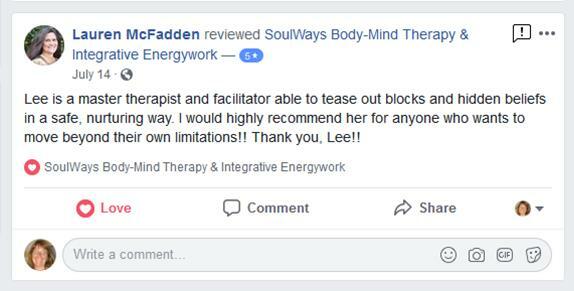 I have had the pleasure of working with Lee and in just a couple sessions, I feel like I accomplished more breakthrough healing than I had the previous months of intensive therapy with a different therapist. Lee's kind and gentle approach helped me feel like I was being heard, and most importantly understood. 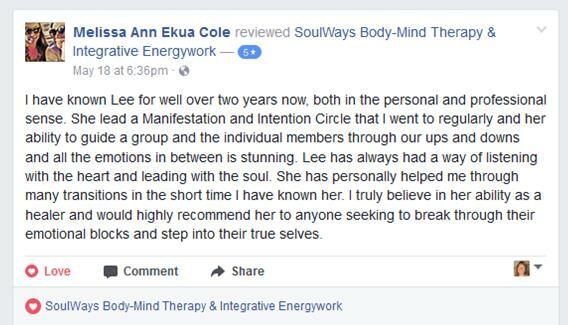 We need more of that in our daily lives, and her techniques in assisting me to dive deep into my soul to release the negative energy and focus on rebuilding the positive light within me has helped me in countless ways find my way back to feeling like my happy self again. Thank you Lee, many blessings to you and to all who have the pleasure to work with you!" --K.Y. 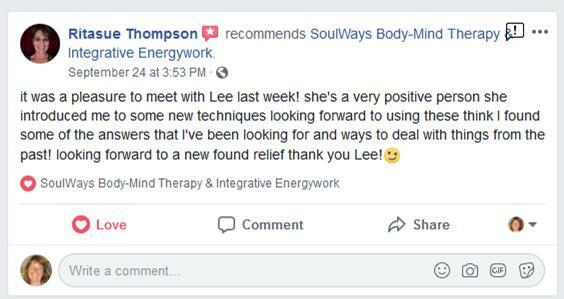 "My experiences with Lee Edwards and SoulWays have been deeply healing! Lee has a gentle and affirming way to help me with blocks that I have carried for years! I've been to many other therapists on my journey called life, and I have to say that no one ever "treated" my whole self: body mind and soul!! 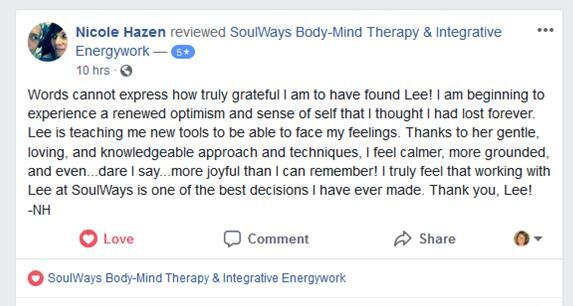 Lee's approach is all encompassing, healing and transformative! I am a firm believer that in order to heal something, ALL of you needs to be addressed. With Lee's experience, compassion, and unique ability to 'sense' things without words, has me extremely grateful! 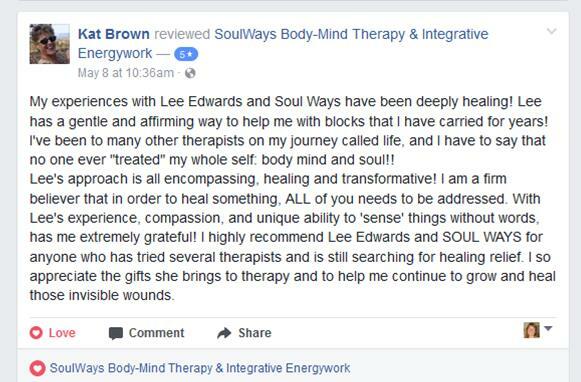 I highly recommend Lee Edwards and SOULWAYS for anyone who has tried several therapists and is still searching for healing relief. I so appreciate the gifts she brings to therapy and to help me continue to grow and heal those invisible wounds." —K.B. "Lee has a lovely space and gentle way - making me very comfortable to settle in & do the work. She has many tools & techniques to get through the layers and find what is calling to be healed. Her ability to truly listen is a gift, as is her intuition which helped me to connect with the places in my body, mind/memories, and emotions that needed to be heard and healed. Thank you, Lee!" —J.E. "As the working mother of two special needs kids (and former caregiver to a parent suffering from dementia), I have lived with profound stress 24/7. 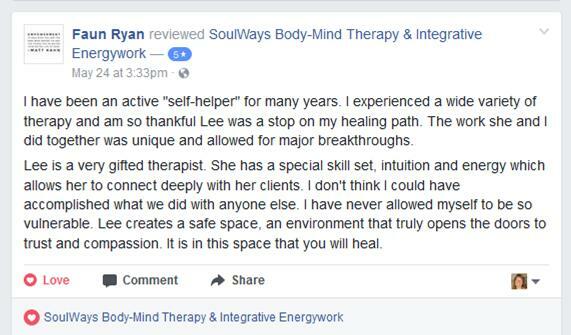 And I have worked with a number of therapists--my kids', family therapists, marriage counselors, and various holistic practitioners. Working with Lee has been a God send! Beyond the benefits of feeling so compassionately heard, sessions with Lee Edwards have relaxed my jaw, softened tight shoulders and neck, and eased repetitive motion issues. She helps my whole system SHED tension! And she teaches me skills to maintain my wellbeing while meeting life's challenges with love and greater ease. I really can't say enough about the power of Lee's work. Don't wait a minute longer: schedule a session and give it a try!" --K.M. 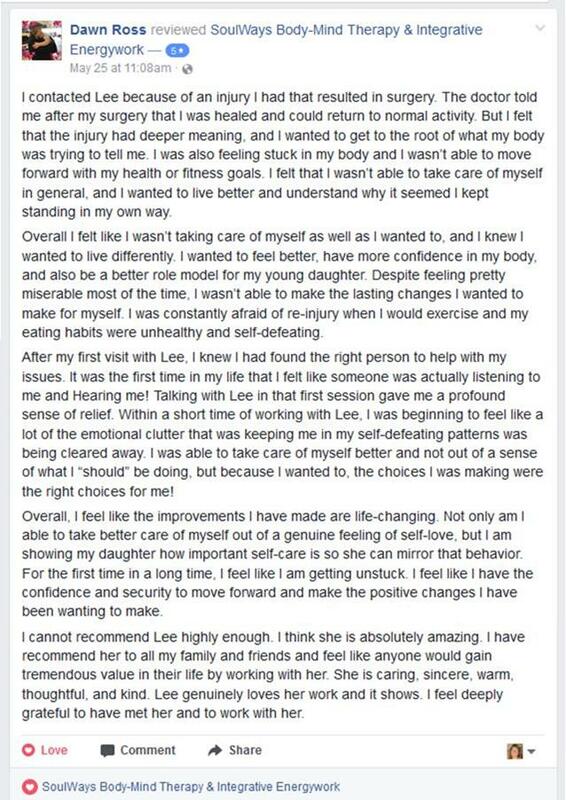 "I have had such an amazing experience working with Lee. I appreciate her open, healing energy and her approach to really hearing you is refreshing. I love that there are so many avenues for healing if you are open minded and willing to gain clarity over the things that are blocking you from reaching your higher good. I would highly recommend Lee Edwards!" —J.R. "Wow! Our work has really made a big difference in my meditation. I've been able to slow down much more than ever before. Thank you so much for sharing your gifts and intuition with me and all your clients!"